The former Cheeseburger in Paradise at Perimeter Place in Dunwoody will soon reopen as Mad Bull's Tavern. 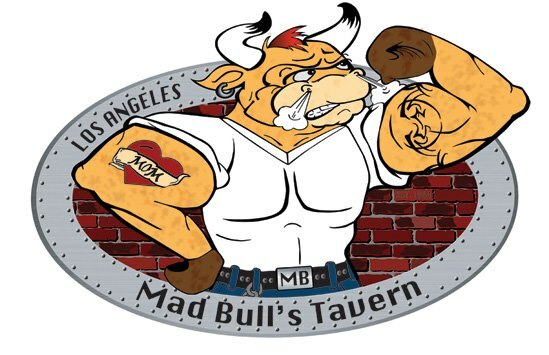 Mad Bull's Tavern is presently a single unit restaurant with one location in Sherman Oaks, California, outside Los Angeles. Mad Bull opened their doors during the summer of 2010, and apparently sees Atlanta, or more specifically, Dunwoody, as their ideal expansion market. According to the restaurant's website, they also have a location in the works for New Jersey. One odd find in my search for information on Mad Bull's was that actor Shia Labeouf was involved in multiple altercations at the Sherman Oaks restaurant in 2011. Mad Bull's logo is a caricatured "mad bull" with an earring, multiple tattoos, signature "MB" belt and a skintight white tee. I showed the logo to a number of readers and friends before drafting this post and everyone was rather confused by the logo and thought it seemed to be an odd choice for the suburban lifestyle center. Perimeter Place is already home to Taco Mac and Applebee's both of which would seem to offer similar menus. Mad Bull's Sherman Oaks location offers lunch and dinner during the week and opens for breakfast on the weekend. I'm told that the Dunwoody location would likely keep similar hours but that a definitive dining schedule, as well as the menu, were both still being tweaked. Mad Bull's seems rather difficult to define as it's not really a sports bar, nor is it a fine dining establishment, nor is it a club, although it seems to possess attributes of all three. One interesting find in my research was what appears to be a bouncer posted up at the front door of the restaurant as well as interior photos that resemble the inside of controversial north Buckhead "restaurant" Scenario. "Bull's Balls" - 2 panko crusted macaroni cheese balls with homemade marinara sauce. "Lord of the Fries" - chili, sweet potato and regular french fries. Work is currently underway to convert the restaurant but there is no planned opening aside from "before the end of the year." What are your thoughts on this new restaurant? What is your favorite Perimeter area restaurant? Does Mad Bull's Tavern sound like it fits in Dunwoody? Please share your thoughts below. Boo. More bland bar food in Perimeter. Sounds like they would do better in L5P. this place sounds and looks terrible, from the logo (for which i assume they commissioned a 7th grade art student) to the dreadful menu item names. There are so many quality restaurants without an Atlanta presence that would fit well here and this is what we get? Boo indeed! Can't see how this works with Taco Mac literally steps away. Higher price points on the menu, shorter beer list...what's their edge? Was there no empty restaurant space in Buckhead. Open "before the end of the year" and closed "before the end of next year." I am going to shock you with my intuition, I bet they scouted the location during the Dunwoody Beer Festival and were smitten by a false-positive. I just checked out their website: the poster for Bottomless Saturdays is totally cheesy. This is Sandy Springs - as affluent as Arlington, VA. This area needs more places like JoeyD's Oak Room. There is a world class hotel (Le Mandarin) within walking distance from the place. And a Hyatt on the way. This type of place belongs in a college town: Deep fried garbage (bathed in cheap sauce) from the factory via a Sysco truck and served by a person who DGAF about the food and is constantly calculating the tip while praying you mindlessly order more overpriced alcohol while you sit in your uncomfortable chair or backless stool and stare at the other losers/diners that are too hypnotized by corporate cheese or flat screen TV's to leave. I infer this from the logo and website. What idiot would think this would do okay in Little Five? This place seems to be known for a good craft beer list, but, as one reader pointed out, it makes no sense that it would open next to Taco Mac which has a much bigger beer list. Taco Mac is very busy on Thursday and Friday Nights (always a wait) at this location so the restaurant might get some spill over from people that don't want to wait but it's hard to imagine that it will be enough. Who knows. We'll just have to see. I mean, look at the mediocre restaurants in the area with good price points that are always busy when some of the high end restaurants are dead. I just moved to Los Angles from Atlanta a year ago. I spent 7 years living in the Perimeter and Buckhead areas. I can assure you that this is no taco mac, and not your typical beer driven Tavern. If I had to sum this one up, I’d have to label it a Hybrid of sorts, more of a trendy Bar / Restaurant& a bit selective on the sports side (not sports overkill). Almost always busy, lots of woman &one of the most popular bars in this part of LA. Definitely Not a Little Five Points bar by any means, but Taco Mac & even the many others of that type in the area should prepare themselves for this one. Theowner has other successful places in LA that I’ve been to and they’re just as successful. Give this one a chance; it’s a step in the right direction for sure. With any luck may help to rid that area of some of the other places we all have come to know. I’d say it’s time for Cold one! well, it appears the owner/franchisee has voiced their opinion. all you have to do is check out their "mad mondays" advertising to determine how many months this place will be in business before regretting the decision/location.